Destination Running? What exactly do I mean by that? Well, I find two forms exist. Both have merit and often the local variant is a subset of the larger version. various articles and blog entry search results. Destination Running quite simply involves traveling some place to run. In my case, these trips tend to include actual races - primarily marathons. Like a destination wedding, an event defines the reason for traveling. This year I went to Antarctica on a cruise designed around the notion of running a marathon on the Southern Continent. However, I have certainly taken advantage of traveling to run races. Last year, I had meetings in Chicago, IL on a Friday and in Albany, NY on a Monday with our CCO and Studio EVP. Not relishing 10 hours and three flights from the Windy City to LA to upstate New York, I instead made a loop through South Dakota and Minnesota to run a half marathon and a 10k. Total flying time was about 5 hours (still three flights), and I ran my personal best in the half marathon (1:29:45). That time allowed me to qualify automatically for this year's New York City Marathon. One destination apparently leads to another. Destination Running in many ways throws challenges at the runner. He must contend with a foreign (sometimes literally) environment, a strange bed, different food and time zone adjustments. Running at peak form requires everything to be aligned, so other than for pampered elite competitors, we mass runners need to absorb these changes on our own and in stride (again sometimes literally). Yet the rewards, at least for me, outweigh the downsides. Seeing a new place can be magical. In fact, with the right race or even fun run, you can find hidden nooks and crannies the locals cannot fathom exist. Because the speed of even the fastest runner allows for some pretty nice sightseeing, this form of exploring beats most others. Cars and bikes - way too fast. Walking - too little distance per hour. Running is a Goldilocks middle ground. This brings me to the minor form of destination running. The beauty of the lowercase cousin involves no planes or intricate plans. A map may be involved and possibly a short car ride. Yet the benefits exceed the minimal planning because so little planning is needed. What I am talking about is a local destination run. Have you ever run to your best friend's house? If not, lace up and do so. Your best friend will likely let you shower and give you a ride home (if you don't want to make the round trip on foot). Too close? Have your best friend drive you 10 miles away and run back to her house? Or maybe run to a park you played in as a kid? Or find some neat path an hour outside of your city and run that. Any town, large or small, will have interesting places to run and see. One destination run I often do is called the "Home Run." 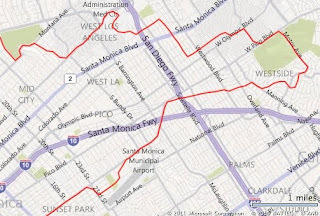 The course starts at my current home and winds itself east through Santa Monica, Brentwood, West LA, Cheviot Hills and back through Ocean Park. On the course, I pass a house we rented briefly in 2004, the apartment where my parents lived when I was born in 1967, the first house we owned and my current office. It's 23.5 miles and a perfect tune up for a marathon. I even get 1000 feet of up and down elevation. Yum. Whether your ambitions are short or long, for sure, don't be a slave to the running. Stop and take pictures or just enjoy the view. Smell the roses if they don't turn away after smelling you. Smile. Say hi to people. Look for paths that may be hard - hilly or narrow. Be safe though. Take a cell phone that has mapping and stash enough money to get a cab back if you get lost. On hot days, take a few bottles of water. With a minimal of planning, you can make your own destination running adventure to reinvigorate your runs, take your mind off those 22 milers or just find a new hidden gem around the corner.